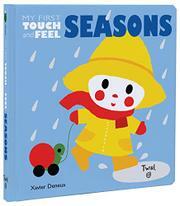 A large 8-inch square trim size is put to good use to introduce the four seasons to young children in this touch-and-feel outing. A red-cheeked white (literally, though the tot tans in summer) child, outfitted in clothes suitable for seasonal activities, is surrounded by seasonal objects in four successive scenes. Each double-page spread begins with a brief description of expected weather for that time of year and includes representative, labeled items. (Readers might question the relevance of a ski helmet and mask to most toddlers, though skiing families will appreciate the reinforcement of safety.) The stylized art makes some of the objects difficult to identify. For example, white dots labeled “snowflakes” lack the lacy magic the term usually implies. The only tactile elements are the child's shirts, which change from a striped summer T-shirt to a fall flannel coat, blue snow suit, and yellow rain slicker and hat in turn and are fairly underwhelming. The final spread is devoted to “the seasons game,” which asks children to name the season associated with several now-familiar objects. Tactile elements are not repeated here, and some of the colors are not consistent with the rest of the book.